Rhys Bennett in action for Mansfield. Peterborough United have raided manager Steve Evans’ old club to make their second major signing of the close season. Centre-back Rhys Bennett signed a two-year deal after falling out of contract at League Two side Mansfield Town. He will formally arrive at the ABAX Stadium on a free transfer on July 1. 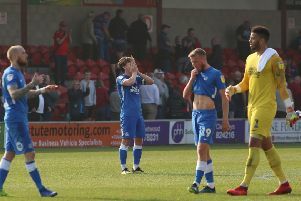 The 26-year-old has over 200 appearances under his belt and has played a host of those games at League One level with Rochdale. He played under Evans and assistant manager Paul Raynor last season with Mansfield Town and the Posh boss is delighted with the second acquisition of his re-building process. Evans told the official Posh website: “Rhys played almost every minute of every game for me when I was the manager of Mansfield Town. We knew all about Rhys from his days at Rochdale. He was a very accomplished centre-back and he could do an equally effective job at right back. In fact, for Rochdale he did a very effective job in the middle of the park. “We knew we had to react to the market place. I had a number of managers, who were not aware that I was interested in bringing Rhys to Peterborough United, asking about his character because they thought he was a top player. We know his character. He is an outstanding professional and he will add some real professionalism to some areas which have been missing here. Posh signed goalkeeper Aaron Chapman from Accrington Stanley yesterday (May 15).